Bidya Bharati Girls’ High School was established by the Vidya Bharati Society for Educational and Scientific Advancement with a view to explore new horizon with a team of enlightened dreamers. So, fifty good years back on 2nd November, 1965, under the able entrepreneurship of the erudite engineer and scientist, Late Sri P.K. Dasgupta and his wife Smt. Bharati Dasgupta, Bidya Bharati ventured forth on its new journey only with nine students in a rented house at New Alipore, Kolkata. By dint of perseverance and determination, courage and integrity Bidya Bharati Girls’ High School has set up a new milestone in academic and co-curricular fields. At present the three units of Bidya Bharati Girls’ High School-Mominpore & Behala (Primary sections) and New Alipore (Secondary and Higher Secondary sections) stand glorified imparting the light of Knowledge to more than 4500 students. 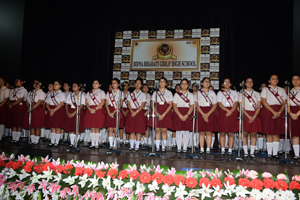 Bidya Bharati Girls’ High school was upgraded to a Higher Secondary School in the year of 1999. Over the years under the able guidance of efficient teachers, students of Bidya Bharati have excelled in various fields. 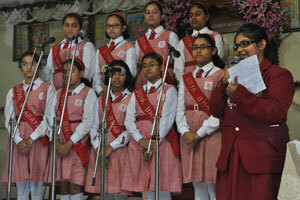 The achievements of Bidya Bharati Girls’ High School in the field of academics deserve special mention. In the year 1991, Rituparna Sen secured the 8th position, in 1994, Indrani Paul secured 2nd position among girls, in 2008 Sanjukta Ghoshal secured 4th position among girls in the overall merit list of Madhyamik Examination. In 2010, Saheli Chowdhury stood 9th among girls in the Higher Secondary Examination. Every year, majority of our students come out with flying colours securing more than 80% & star (*) marks in different subjects. The achievements of Bidya Bharati have not been limited to academic activities only. They have excelled in all kinds of co-curricular activities too. They have won laurels at national and international levels and taken part in exchange programmes. Presently, teachers and students have started ‘Dipanwita’ an evening school, to spread the light of education among the street children under the guidance of our Hony. President Smt. Purnima Mukherjee and Headmistress Smt. Sharmistha Banerjee.